MANHATTAN RAIN (AUS) (Bay 2006-Stud 2010). 2 wins at 2, AJC Sires Produce S., Gr.1. Sire of 246 rnrs, 146 wnrs, 13 SW, inc. She Will Reign (ATC Golden Slipper S., Gr.1), Whisky Baron, Wild Rain, Moonovermanhattan, Scarlet Rain, Runaway, Jamaican Rain, Let Me Sleep on It, Indian Thunder, Manhattan Street, Crafty, Manapine, Ondina, SP Tango Rain, Man of Choice, Promise to Reign, Boundary, Light Up Manhattan, Manhattan Avenue, Gibraltar Girl, etc. NITOUCHE, by Hussonet. Winner at 1000m in Aust. Dam of two named foals, one to race. Yankee Roller. Winner at 1000m in 2018-19 in Aust. Off to Gaul. 4 wins from 1600m to 2200m, R249,600, Turffontein World Sports Betting H.
HOLY ROMAN EMPEROR (Danehill). Champion 2YO Colt in France in 2006. 4 wins at 2, £53,800, €523,023, Curragh Phoenix S., Gr.1, Longchamp Grand Criterium, Gr.1, Curragh Railway S., Gr.2, Leopardstown Irish Stallion Farms 2YO S., 2d Curragh National S., Gr.1, Newmarket Dewhurst S., Gr.1. Champion sire. Los Barbados. 2 wins at 2200m, 2800m in Ireland and U.A.E, Meydan EGA Al Taweelah Trophy H., 2d Meydan Range Rover Sport H., Casthouse Trophy H., Jebel Ali Shadwell Farm S., 3d Meydan Sobha H., 4th Meydan Entisar S., L.
HEART OF OAK (Woodman). 6 wins from 1300m to 1600m in Ireland, Germany and Sweden, Jagersro Per-Erik Pramms Minneslopning, L, Hannover Toto Lotto Sprint Preis, L. Sire. BIG VIKING (Theatrical). 2 wins-1 at 2-at 1800m, 2000m, Mainichi Broadcasting System Sho Kyoto Yonsai Tokubetsu, L, 2d Tokyo Sports Hai Sansai S., L, Tokyo June S., 3d Tokyo Meguro Kinen, L, Hanshin Osaka Humberg Cup, 4th Nakayama Sports Nippon Sho Stayers S., L.
Born to Play - Perfect to Play (H.K.) (Born to Sea). Placed at 3, 2d Curragh Gallinule S., Gr.3. L'ENJOLEUR (Buckpasser). 15 wins-8 at 2-from 6f to 1½m, US$546,079, Laurel Futurity S., Gr.1, Woodbine Clarendon S., L, Colonel RS McLaughlin H., L, Quebec Derby, L, Coronation Futurity S., L, Carling O'Keefe Invitational H., L, Queen's Plate S., L, Cup & Saucer S., L, Ontario Foaled S., L, Assiniboia Downs Harry Jeffrey H., L, Fort Erie Prince of Wales S., L, Summer S., L, Winnipeg Futurity, L, Manitoba Derby, L. Sire. TIME BANDIT (Time for a Change). 3 wins at 2, US$210,188, Saratoga Sanford S., Gr.3, Churchill Downs Bashford Manor S., Gr.3, 2d Turfway Park Kentucky Cup Juvenile S., Gr.3, 3d Saratoga Hopeful S., Gr.1. Sire. LOCAL TIME (Invincible Spirit). 7 wins-3 at 2-from 1400m to 1900m in GB, Turkey and U.A.E, Newmarket Oh So Sharp S., Gr.3, Meydan UAE Oaks, Gr.3, Istanbul Trophy, Gr.3, Meydan UAE One Thousand Guineas, L.
ELEGANT COMPOSURE (Bradbury's Luck). 7 wins to 1400m, A$200,000, Qld Tatt's RC Memorial Classic, L, 3d GCTC Silk Stocking H., L.
I AM A STAR (I Am Invincible). 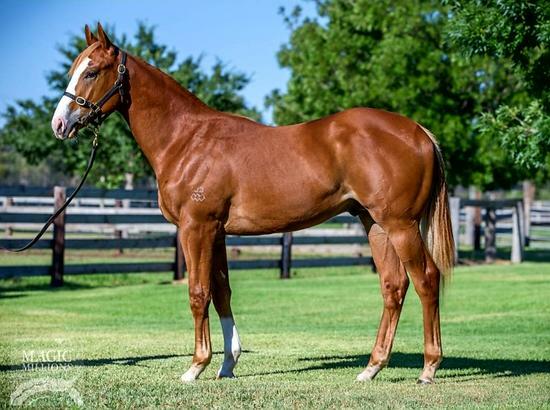 10 wins-2 at 2-from 1100m to 1600m, A$1,560,300, to 2018-19, VRC Myer Classic, Gr.1, AV Kewney S., Gr.2, Let's Elope S., Gr.2, MVRC WH Stocks S., Gr.2-twice, Sunline S., Gr.2, MRC Quezette S., Gr.3, Ladies Day Vase, Gr.3, SAJC National S., Gr.3, 2d MRC Thousand Guineas, Gr.1, Rubiton S., Gr.2, 3d SAJC Ubet Classic, Gr.1, Moonee Valley Fillies Classic, Gr.2. TRUST OR BUST (Trust n Luck). 8 wins to 5½f, US$415,456, Mountaineer Park Panhandle H., L, Charles Town Webb Snyder S., L.
HI HAPPY (Pure Prize). Horse of the Year, Champion 3YO Colt, Stayer & Triple Crown Winner in Argentina in 2015-16. 8 wins-1 at 2-from 1600m to 2500m, US$845,145, 4,414,000Arg$, to 2018 in U.S.A. and Argentina, San Isidro G.P. Carlos Pellegrini, Gr.1, Belmont Man o' War S., Gr.1, San Isidro G.P. Jockey Club, Gr.1, G.P. Dos Mil Guineas, Gr.1, Palermo G.P. Nacional, Gr.1, Gulfstream Park Pan American S., Gr.2, San Isidro Clasico Ensayo, Gr.2, 2d Belmont Knickerbocker S., Gr.2, 3d Belmont Manhattan S., Gr.1, Gulfstream Park Turf S., Gr.1, Gulfstream Park Fort Lauderdale S., Gr.2, Santa Anita Tokyo City Cup, Gr.3. HINZ (Pure Prize). 14 wins-1 at 2-from 1000m to 1600m in Chile, Hipodromo Chile Clasico Dos Mil Guineas, Gr.1, Clasico República del Perú, Clasico Bomberos de Chile-3 times, Clasico Radio Agricultura, Premio Odiseo, 2d Hipodromo Chile Clasico Selección de Velocistas, Gr.3, Clasico Asocacion de Propietarios de Caballos FS de Carreras, Clasico Ciudad de Santiago, Clasico Gran Ducato, Clasico Cencerro, Clasico Oakland, 4th Hipodromo Chile Clasico Seleccion de Velocistas, Gr.3. SECRET LAUNCH (Relaunch). 5 wins-2 at 2-from 6f to 8½f, Emerald H., L, 3d Fairplex Pomona Derby, L.
UNBRIDLED COURAGE (Leroidesanimaux). 7 wins from 5f to 1m, US$245,011, to 2018, Gulfstream Park Treasure Coast S., L, 2d Gulfstream Park Ginger Punch S., L.
ANEVAY (Exceed and Excel). 2 wins-1 at 2-at 1100m, A$117,330, VRC Talindert S., L, 2d MRC Blue Diamond Preview (f), L. Producer. TULIP (Pierro). 4 wins-2 at 2-to 1400m, A$1,049,875, to 2018-19, ATC Magic Night S., Gr.3, MVRC Typhoon Tracy S., Gr.3, 2d MRC Blue Diamond Preview (f), Gr.3, 3d ATC Golden Slipper S., Gr.1. SACRED EYE (High Chaparral). 2 wins at 1300m, 2000m, A$424,650, MRC Caulfield Classic, Gr.3, 2d VRC Edward Manifold S., Gr.2, 4th SAJC Schweppes Oaks, Gr.1, ATC Adrian Knox S., Gr.3. SIR PLUSH (Pins). 8 wins from 1100m to 2100m, A$498,585, to 2018-19, Gosford Gold Cup, L, ATC Bowermans Office Furniture H.
FLYING SPUR (Danehill). Second on The 1994-95 Australasian 2YO Classification. 6 wins-3 at 2-from 1000m to 1600m, A$2,051,090, STC Golden Slipper S., Gr.1, AJC All-Aged S., Gr.1, Australian Guineas, Gr.1, STC Peter Pan S., Gr.2, VATC Blue Diamond Prelude, Gr.3, 2d VATC Blue Diamond S., Gr.1, Futurity S., Gr.1, STC Hill S., Gr.2, AJC Up & Coming S., Gr.3, VATC Zeditave S., L, 3d VRC Sires' Produce S., Gr.1, STC George Ryder S., Gr.1. Champion sire. THINK BLEUE (So You Think). 4 wins from 1400m to 1700m, A$296,850, in 2017-18, MVRC Alexandra S., Gr.3, VRC William Newton VC H., MRC Clanbrooke Racing H., 2d MRC United Petroleum H.
MEDAILLE D'OR (Secretariat). Champion 2YO colt in Canada in 1978. 3 wins at 2, Woodbine Coronation Futurity S., L, 2d Woodbine Clarendon S., L, Cup & Saucer S., L, Winnipeg Futurity, L. Sire. NOOR AL HAWA (Makfi). Champion 3YO Miler in Germany in 2016. 8 wins-1 at 2-from 1500m to 2000m, €308,000, QAR2,698,869, to 2018 in France, Germany and Qatar, Düsseldorf Grosse Europa Meile, Gr.3, Grosser Preis der Landeshauptstadt Düsseldorf, Gr.3, 3d Chantilly Prix Daniel Wildenstein, Gr.2, Cologne Mehl Mülhens Rennen, Gr.2. BONNDADDY'S (B. G.'s Drone). 11 wins-1 at 2-to 6½f, US$315,191, Sunland Park Mt Cristo Rey H., L, Albuquerque Casey Darnell Pony Express S., L.
FAVORITE (Dunkirk). 11 wins from 1200m to 1900m in Chile, Valparaiso Clasico Municipal de Viña del Mar, Gr.3, Clasico Copa El Mercurio, L-twice, Club Hipico Clasico Zenith, 2d Valparaiso Clasico Copa El Mercurio, L.
TALETOBETOLD (Tale of the Cat). 8 wins-2 at 2-to 6f, US$469,550, Churchill Downs Open Mind S., L, 2d Keeneland Franklin County S., L-twice. Producer. TURBO MISS (Sebring). 5 wins-1 at 2-to 1400m, A$202,175, VRC Frances Tressady S., Gr.3, MRC Polytrack H., 2d MVRC Fisher & Paykel H., 3d MRC Victoria H., Gr.3. PLETHORA (First Samurai). 3 wins at 6f, 1m, Northlands Park RK (Red) Smith H., L, 2d Northlands Park Wild Rose H., L. Producer. BEAR TOUGH TIGER (Roar of the Tiger). 11 wins to 6½f, US$526,546, Woodbine Kennedy Road S., Gr.3, 2d Woodbine Jacques Cartier S., L, 3d Woodbine Nearctic S., Gr.1, 4th Gulfstream Park Sunshine Millions Sprint S., L.
ALIGNEMENT (Pivotal). 8 wins-1 at 2-from 1600m to 2100m, €296,840, to 2018, Longchamp Prix Dollar, Gr.2, Clairefontaine Prix Pelleas, L, Chantilly Prix de Coye, Longchamp Prix de l'Axe Majeur, Maisons-Laffitte Prix Mieuxce, Prix Commandeur, 2d Strasbourg Grand Prix de la Region Grand Est, L, 3d Craon Grand Prix de la Ville de Craon-Mayenne, L.
Race Record: 3 Starts 0-0-0 A$4,710.